Treasury Secretary Geithner studied Chinese in college and spent two summers in Beijing; Treasury Secretary Lew did not. Ambassador Huntsman is extremely knowledgeable about China, and Ambassador Locke is Chinese-American; Ambassador Baucus is neither. Secretary Clinton articulated a masterful vision for U.S. policy toward Asia and China in the form of the pivot; Secretary Kerry did not. National Security Advisor Donilon was interested in China; National Security Advisor Rice is not. There are no senior China experts in the relevant U.S. bureaucracies. Points one and two can be dismissed relatively easily as true, but irrelevant. The real question is whether any knowledge of China, Chinese, or being Chinese contributed to the United States having a policy advantage in its relations with Beijing. Did Secretary Geithner’s China background, for example, yield a better outcome on currency negotiations? It does not seem so. Moreover, although I generally favor an Ambassador to China who is knowledgeable and speaks Chinese, Ambassador Huntsman and Ambassador Locke (who does not speak Chinese) both had very challenging periods during their respective tenures as ambassador. Ambassador Huntsman came under fire for taking an interest in sensitive political issues, while Ambassador Locke was subjected to horrific personal attacks by the Chinese media for making the Chinese leadership look bad with his “common man” persona. Near as I can tell, Ambassador Baucus’ tenure has thus far been drama-free, which is probably not a bad thing when your primary job is diplomacy. Point three is certainly also true. However, it is useful to ask whether there is any need for Secretary Kerry to articulate a vibrant new vision for U.S. policy toward Asia or China. Secretary Clinton and President Obama already did that. What Secretary Kerry needs to do is advance implementation of the pivot and to keep the ball moving forward in the U.S.-China relationship. From my perspective, the State Department under his direction has done both. I cannot evaluate point four except to say that Secretary Rice engaged with the Chinese extensively during her time as ambassador to the United Nations, and as national security adviser has delivered a major speech on Asia and traveled to the region. In my limited encounter with her, she was both interested and knowledgeable about China. Point five is simply ridiculous. Evan Medeiros, Jeff Prescott, Jonathan Stromseth, David Helvey, David Shear, Sharon Yuan, and a multitude of other talented China scholars and analysts occupy senior positions in the core bureaucracies. There is no dearth of China expertise in the U.S. government. New York City, where I live, has a deal culture in which the emphasis is on outcome not optics. So let’s consider the outcomes of this purported “B” team. 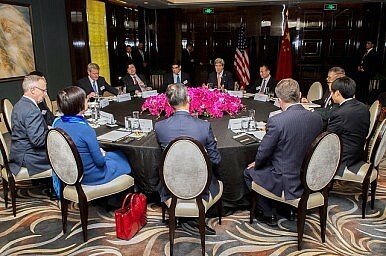 Across the board, the “B” team has delivered an “A” performance on China policy: separate but joint pledges on climate change; agreements on visa policy, on rules of the road for maritime and air encounters in the western Pacific, and on reducing or eliminating tariffs on as many as two hundred information technology goods. Levels of bilateral trade and Chinese investment into the United States are rising, and both sides are putting real energy behind efforts to achieve a bilateral investment treaty. No one should be arguing with the list of achievements that this team is racking up, particularly in the face of a very tough new China under President Xi Jinping. From where I sit, there is no validity to the claim that the current set of officials tasked with directing U.S. policy toward China are any less talented or committed than their predecessors. And more to the point, they are delivering results that matter. From John Leighton Stuart to Gary Locke, US Ambassadors have been influential in Beijing but have little impact at home. Trump, China, and Ah QPence on Political Interference: ‘China Wants a Different American President’Is the Trade War Impacting US Views of China?The Misconceptions at the Heart of the US-China Trade WarDid China and the US Overreact to Tillerson's Remarks On US-China Relations?